One of the easiest and perhaps fun and exciting ways to improve your wellbeing within the workplace or at home is to bring the outside in. Plants in the workplace help to reduce stress, improve attitudes, and purify, all whilst emitting a meditative vibe which can help balance out stress levels. 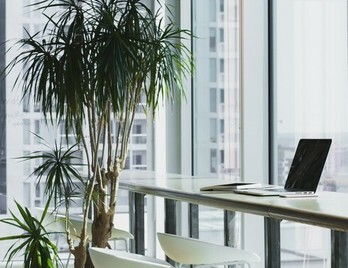 Various studies of commercial work environments found that offices with indoor plants had less employee absenteeism compared to offices without. Putting research and statistics aside, however, plants offer many health benefits and can improve wellbeing for very little outlay. Brighten and liven up your workplace with some of our carefully selected plants for your workplace. 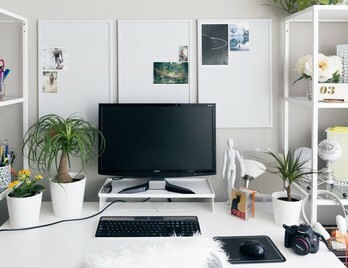 So you like the idea of populating your desk or workspace with plants but are not quite sure where to start? Or maybe you are too busy for a consultation and don't have the time for the research? This starter office bundle is a great way to introduce yourself to the benefits and joys of surrounding yourself with plants. Each plant within the bundle has been carefully selected with the user in mind so are low maintenance and easy to look after. The starter office bundle is the perfect choice for your home or office environment. So you like the idea of populating your office space with plants but are not quite sure where to start? Or maybe you are too busy to research and source the plants yourself? Ambience office bundle is a great way of transforming your available space into a little urban jungle and oasis. Each plant within the bundle has been carefully selected with the user and environment in mind, so are low maintenance and easy to look after. The ambience office bundle is the perfect choice for larger spaces and team environments. So you like the idea of populating your office space with plants but are not quite sure where to start? Or maybe you are too busy to research and source the plants yourself? Impact office bundle will transform your available space into an impressive urban jungle and oasis. Each plant within the bundle has been carefully selected with the user and environment in mind, so are low maintenance and easy to look after. The impact office bundle is the perfect choice for larger spaces, team environments, and breakout areas. 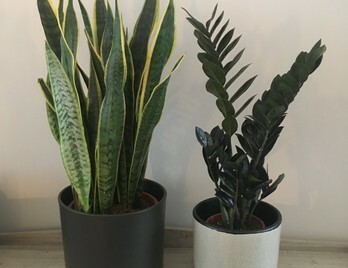 Sansevieria (aka Snake Plant or Mother - In - Laws tongue) is a firm favourite at Urban Office Plants and Office Reality. It's a real tough nut that can survive and put up with almost any environment. It cleans the air of toxins and features on the NASA clean air study as one of the best for this purpose. This plant is also nicknamed the bedroom plant as it puts out Oxygen at night time. A rubber plant is a type of plant with broad attractive shiny leaves and grows naturally within forests of Asia. They are a great air purifier and feature on the NASA clean air study. 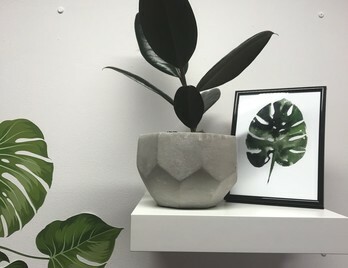 The rubber plants growth is also dependent and proportional to its planter size, at 1-2 foot tall, it is suited as a standalone plant on a desk, table, shelf or windowsill. When it begins to grow, it suits being placed in breakout areas or door entrances. The cactus has had a resurgence recently and it's easy to see why. It's a very low maintenance plant which is ideal for those who are busy but still want some plant life. 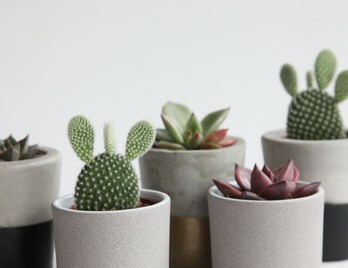 They are almost perfect plants for modern times, and have been bought and collected by millennials, with grow kits retailing in outlets such as Urban Outfitters. This Cactus plant comes with its own Sass & Belle Cactus planter. The mixed Succulent gift box is the perfect gift. You can use this to give as a birthday plant-starter kit, a housewarming gift, or a new job celebration present. It's one of our favourites as it's such an extremely versatile gift box. Humans have a natural desire to be surrounded and connected with nature, this is known scientifically as 'biophillia'. Unfortunately, the spaces we often occupy at work are often limited of any connections to nature. This however is changing as people are beginning to realise the benefits that having plants can have. The main benefits of plants are that they improve health and productivity as they purify the air, creating a 'cleaner air' environment. Research and studies have shown that the air created by having plants and the 'wellbeing effect' that they offer increases productivity up to 15%. It's apparent that buildings and office environments appear calming and simply a better place to work when plants are present. Plants make people feel at ease, so they are well suited to reception areas, waiting rooms and offices where visitors patients or staff may feel the least at ease. Another benefit of having plants in the workplace is that they have acoustical properties. They can act as sound barriers within an open plan environment and make an interesting refreshing alternative to the everyday office screens, or why not mix the two together to create your own green wall or screen? There are many plants and species which survive well in an indoor environment and it has been suggested that these plants are the best, low maintenance plants to have in an office or at home. Aloe vera is a succulent plant species and evergreen perennial (a plant that lives more than two years) it originates from the Arabian Peninsula and grows wild tropical climates around the world and is cultivated for agricultural and medicinal uses. It is an easy attractive plant and makes a great addition to your desk, window sill or room. They enjoy a lot of sunlight so would be suited to a window position but also do well in indirect sunlight and even artificial light. They are also very easy to maintain and don't need lots of watering, in fact, it can go for weeks without water so makes an ideal candidate for those with busy schedules. Spider Plants are another hardy perennial which is native to tropical and southern Africa. It is an easy to maintain plant as its environmental origins are much harsher than the conditions we would subject them to. Spider plants, therefore, make great office plants and are perfect for high shelves or storage units. 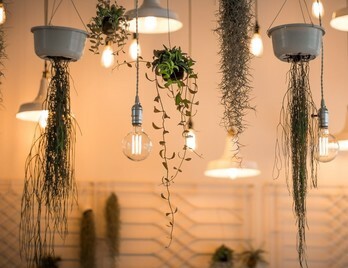 This Spider Plants would also work well in hanging pots suspended from the ceiling as the leaves cascade and trail downwards. They thrive in partial sun or shade and seem to be able to look after themselves and are tolerant of neglect. The other benefits of Spider Plants are that they are air purifiers as they combat harmful toxins that we are subject to making the air cleaner. If you have a large office or room it would be beneficial to choose a handful as they would be a welcome addition. Whenever we think of the desert or perhaps watch films set in the desert we often see the humble cactus or cacti making an appearance. This is because the desert and dry regions form the cacti natural habitat and the cacti can survive with very little maintenance and water. The cactus is able to store water in it's body and roots spread to collect water when it rains. Cacti are natives of the Americas, ranging from Patagonia, Argentina to parts of western Canada in the north. 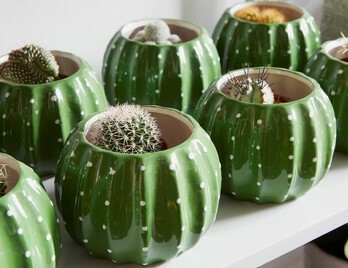 The cactus, therefore, makes an excellent low maintenance small desk plant and looks great as a collection or on its own. They come in all shapes and sizes and there are well over a 1000 different species so each one has its own unique character. Devils Ivy (Epipremnum aureum) also known as pothos is a type of tropical evergreen vine native to the Solomon Islands. The leaves are large full and often heart-shaped that come in a variety of light and dark colours. Devils Ivy also features beautiful trailing stems, so like the Spider Plant, would suit a hanging planter or a high perch. This particular species will adapt well to various office conditions, from low light levels to brighter ones and even grows well under fluorescent lights. Another main benefit of Devils Ivy is that it has air purifying features and features on NASA's Clean Air Study chart of air filtering plants. This plant is extremely difficult to kill so would suit even the most forgetful office worker or individual who feels that they may be prone to neglect their plant care duties. The mighty rubber tree has been a favorite houseplant for years and was once grown for the rubber produced from its sap. It is a species of plant in the fig genus native to East India, Nepal, Bhutan, Malaysia and Indonesia. The plant has large, thick, glossy green leaves which will grow well in most homes and offices and its exotic appearance will brighten up any corner, living space or redundant office space. This particular plant also has excellent air purifying qualities and features on the NASA's Clean Air Study chart of air filtering plants. They can get fairly large if you don't prune them and may need repotting if it outgrows its original pot or planter, this is easy to do with the right amount of care and attention. Peace lilies make excellent plants for either the office or home and its easy to see why they are a popular choice. They enjoy medium to low light levels and thrive in varying conditions. There are a wide variety of sizes and types of peace lilies and most serve as floor plants as they can reach 3 feet tall and grow wide with large leaves. The Peace Lily is another beneficial air cleansing plant which purifies the surrounding air and helps to cleanse the air we breathe. In fact, if people only knew of the toxins it filters out it would be one of the most popular plants in this list. The toxins that the Peace Lily is known to combat is: benzene, formaldehyde, trichloroethylene, xylene, and ammonia. 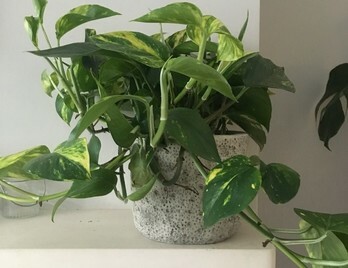 It's known, however, that the Peace Lilly's can be harmful to cats and dogs so please be aware that the plant will need to be contained or out of reach from your pets if considering this plant for the home or office.